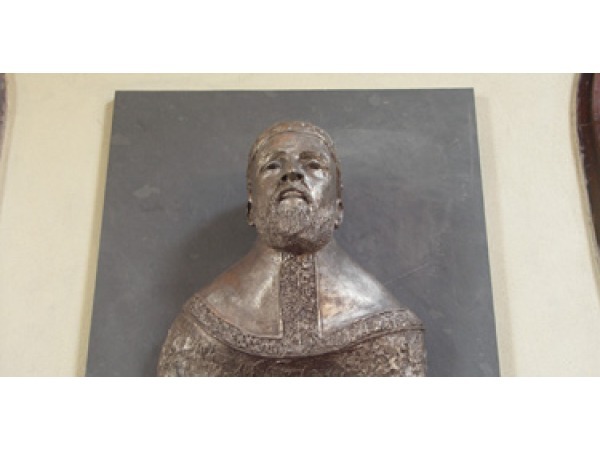 The new sculpture of Illiam Dhone in Malew Parish Church. A stunning new sculpture of the Manx Patriot Illiam Dhone (William Christian) has been unveiled in Malew Parish Church. Commissioned by the Friends of Malew Church, and created by Manx-born sculptor Bryan Kneale, the commission has been entirely funded by the Manx Heritage Foundation. Illiam Dhone is a controversial figure in Manx history. He was executed at Hango Hill in 1663 on a charge of treason brought by Charles, 8th Earl of Derby. Many believe that this was an unjust charge, especially as the Act of Indemnity introduced by King Charles II in England was designed to draw a line under all acts committed during the recent English Civil War. There was dispute as to whether the Act applied in the Isle of Man, and when Illiam Dhone returned to the Island after the War, the Earl had him arrested and executed. The Earl and the Island's Deemsters were subsequently summoned to London and vilified by the King; the Deemsters being held in an English prison for a year. On the Island, Illiam Dhone became a martyr and folk-hero, a symbol of the Island's cherished freedoms and traditional rights. His occasional spells in prison on charges of misappropriating Manx taxes long forgotten.